Calling all Prom Goers! It's that time again to get your pic skills on for Prom! How does it work? Check out the details below. On your mark, get your mobile devices ready, and GO! 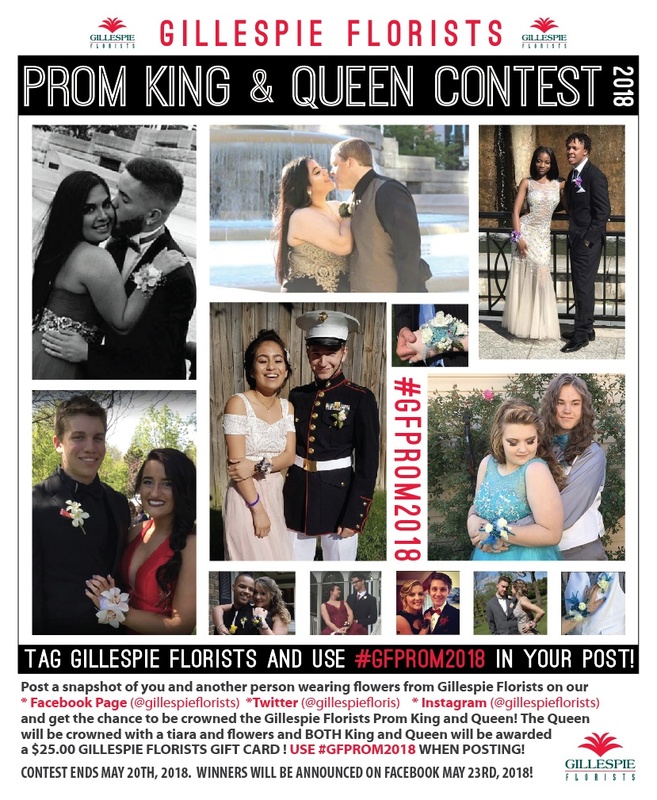 Post a snapshot of you and another person wearing flowers from Gillespie Florists on our Facebook Page, Twitter or Instagram and get the chance to be crowned the Gillespie Florists Prom King & Queen! · Take a snapshot of you and your date wearing Gillespie's Flowers. · Post it on our Wall or use #GFPROM2018 - make sure it’s a public post! · Tag your self in the photo as well as anyone else in the picture. · We'll put it in our "Prom King & Queen Contest Album 2017". been added to the album. The Queen will be crowned with a tiara and flowers and both King and Queen will be awarded a $25.00 Gift Card to Gillespie Florists! And don't forget, Bragging Rights! Contest ends May 20th, 2017. Winners will be announced on Facebook May 23rd! Post to our Social Media Pages!